Free Shipping Included! 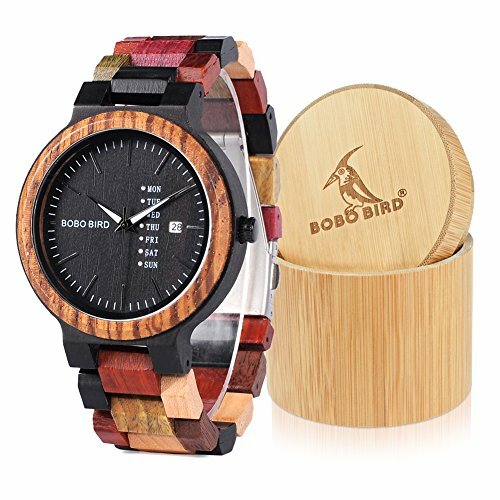 BOBO Bird Natural Wood Watch Colorful Mens Wooden Watches Week & Date Display Japanese Quartz Movement Chronograph Unique Wristwatch for Men by BOBO BIRD at Watches Sales. MPN: p14-1. Hurry! Limited time offer. Offer valid only while supplies last. BOBO BIRD is a manufaturer who design and produce watches, we hold our watches to the highest standards of craftsmanship, authenticity, and quality. 1. If the watch is too big for the wrist, you can use the removal tool to remove one or two chips from the strap. 2. Wooden watches should not be wet or soaked in water in everyday life. Try to avoid wearing watches while swimming, showering, or when there is heavy rain. 4. Clean the stain frequently to prevent dust from affecting the watch. Handmade natural wooden watch,made of precious ebony, red sandalwood, zebra wood, natural bamboo mixed materials, no paint , exquisite craftsmanship, truly natural products do not miss. Adjustable multi-color watch band, unique mix of pure wood color, beautiful, lightweight, particularly eye-catching wood watch wear on the wrist. Analogue quartz men's watch wood watch with large face dial, calendar and week display, easy to read time, convenient for daily use. mens watch, a collection of leisure, retro, fashion, popular in watch collectors, the wrist watch suitable for all kinds of people to wear . Recommended gifts for your girlfriend, lover, mom, Daughter, sister, or relatives when On Christmas, Birthdays, Anniversary, Valentine's Day, Thanksgiving, Halloween, Weddings, etc.